Such a great way to visit Frederick. The Traveler's House is "the closest place to home" - warm, relaxing and inviting. Very much a "keeper." Thank you so much for creating a perfect place to vacation. We have been at The Artist's House for a full month and have been very comfortable here. We are sad to leave Frederick..... Our daughter really enjoyed Baker Park and it was such a beautiful place for our family pictures this season. Thank you for everything. It's been a pleasure! P.S. We will be back! Perfect sense of normalcy during long term visit with family over Thanksgiving holiday 2012. The Collector’s House is a charming vacation home with a great variety of nearby restaurants to choose from. Nancy and her husband were very gracious and helpful. After spending the days site seeing in DC , Baltimore Inner Harbor, and Gettysburg, we really enjoyed relaxing in the garden under the grape arbor with plenty of outdoor seating. Wonderful Vacation! We 3 ROMEOs (Retired Old Men Eating Out) just spent a relaxed weekend here at the Artist's House. I think we are the first guests to stay here, and everything was new and immaculate. The kitchen was big enough for the 3 of us to have a leisurely breakfast, which was the extent of our cooking. And the living room couch and chairs were so comfortable we had a hard time leaving the room. The large TV was fantastic, with a crystal clear picture. We enjoyed watching a few old movies on the DVD player. We had several great meals in Frederick, did some shopping and went to a car show downtown, and even went to a Roller Derby in Hagerstown. We all liked the fact that we each had our own private bedroom with those fancy beds that we could adjust from soft to firm with the remote controls (a bit of a challenge at first for us 70 and 80-something old-timers, but we figured it out after a while). We also were surprised that, given we were in a downtown area over the weekend, we heard no noise during the night and all slept soundly. We sat on the front porch each day and watched the locals walk and drive up and down the street. Great conversation topics ensued. There was so much we didn't have time to see in Frederick that we all decided that we'll have to come back again sometime soon. Thank you very much for sharing your comfortable home with us. We enjoyed our short stay. The Travleler's House offered perfect accommodations for our Scrapbooking Retreat. Cozy and good location. We agree with the IL PORTO recommendation. We'll use the Traveler's or Artist's House for our future Frederick stays. Wonderful hostess, too! Easy walk to historical downtown and restaurants. The Artist's House is filled with local artists' works and a book to share their stories which makes this place fun to stay at. Plenty of room for 4 adults. Really appreciated the two full baths, plus 1/2 bath on main floor. Laundry made it easy to pack light. Nice front porch to sit out on. Kitchen was well equipped and really appreciated the spices and oil available for cooking. Parking in the back was good - keeping car out of street traffic. Beautiful home, super fun stay!!! We rented The Artist's House Friday through Sunday for my sister's Bachelorette Weekend. We arrived late Friday night, 4 of us. It really was a beautiful little house, elegantly decorated, with natural wood floors and staircase, a full kitchen, dining room and living room, 3 bedrooms upstairs and 3 bathrooms. It was great being there all together! On Friday night, we even used the TV and cable to do "on demand" karaoke!! (Don't tell anyone hehehe). The proprietor lady, Nancy, was so awesome, she'd decorated the house for a bachelorette party. On Saturday, another friend arrived, so we had 5. Two slept in the King bed, 2 in the Queen bed, and 1 in the twin bed. Plenty of space! And since there were 2 full baths, showering was not an issue with the number of people. On Saturday, we walked into town twice - for lunch and dinner/partying. It was a pleasant walk, in spite of the cold, and only about 8 minutes from town. Staying at the Artist's House really made the weekend special! I highly recommend it! There were five of us in Frederick for a family wedding at Thorpewood. We stayed at the Collector's House for a week. The house was clean, cozy, nicely furnished and in a great location. The garden and pergola were very special. It was an easy walk to downtown and the fantastic restaurant scene and shops. Without any reservation, we absolutely recommend this house. Nancy was a great hostess! The Artist's House was so charming. I’ve stayed in a lot of vacation rentals and this one felt like an actual home. It was well stocked with plenty of all the basic amenities you could possibly need, and it was SO CLEAN. You can tell Nancy cares about her rentals and keeps up with them. 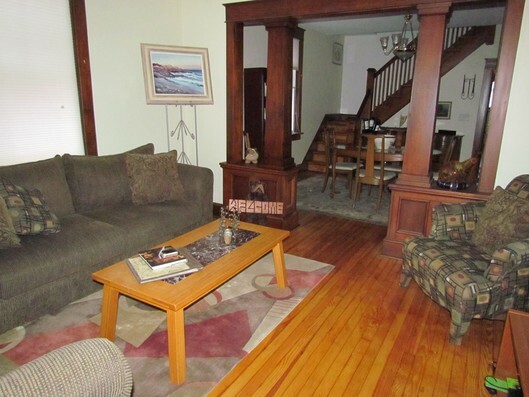 The house was beautiful, with original hardwood floors and beautiful original doors. There was also a sweet little “secret” garden in the book that is very “English cottage” feel. Loved it. The location is very central to downtown with good dining and shopping. Would highly recommend!